Network operation manager is given the task to monitor the performance of the organization’s network on daily basis. They also oversee the network of staff and point out the incidents and changes that occur in the networking system. There can be many reasons for which a network operation manager can decide to leave the job. The employee working as a network operation manager may decide to leave because he is unhappy with the job or he has got a job offer that he cannot refuse. No matter what decision you have taken, you are required to write an efficient resignation letter to your boss. Writing a resignation letter can be a most difficult task that you have ever done. However, if you are passionate to move forward in your professional life, then writing a resignation letter is a right thing that you can do. It is recommended that you verbally notify your employer or supervisor, about your decision. Ideally, an employee is able to resign from an organization in a good way if he has developed good relations with his boss. 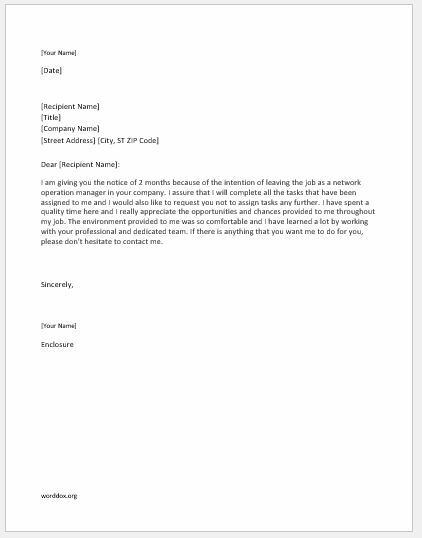 Here is a sample resignation letter for the post of network manager operation manager that can be reviewed by drafting one for yourself. I am giving you the notice of 2 months because of the intention of leaving the job as a network operation manager in your company. I assure that I will complete all the tasks that have been assigned to me and I would also like to request you not to assign tasks any further. I have spent a quality time here and I really appreciate the opportunities and chances provided to me throughout my job. The environment provided to me was so comfortable and I have learned a lot by working with your professional and dedicated team. If there is anything that you want me to do for you, please don’t hesitate to contact me.